Above: Resident-business owner Brooke Stillwell is welcoming the community to be pampered at a Customer Appreciation Day to celebrate Southborough Wellness’ first year in business. Almost a year ago, I shared news of a new business opened in town by residents. 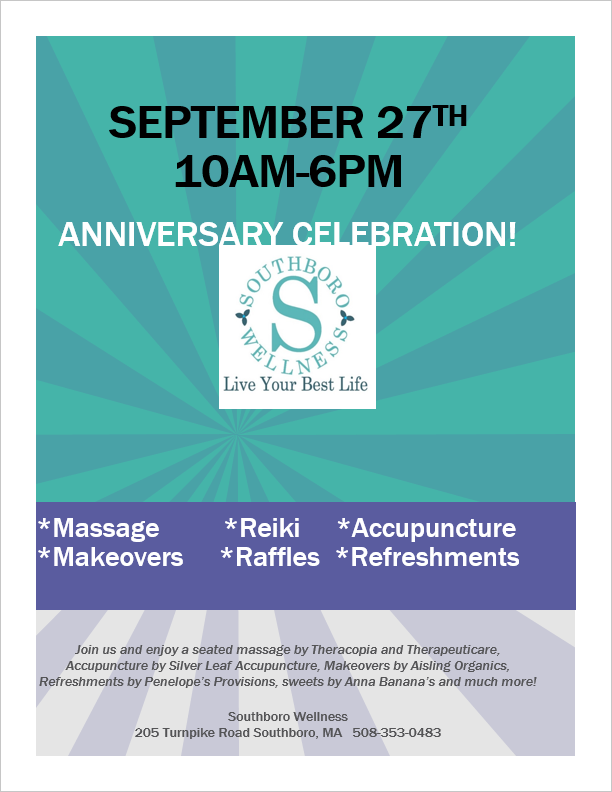 Now, Southboro Wellness is celebrating its first Anniversary with a “Customer Appreciation Day”. 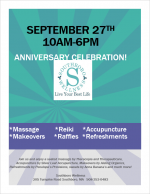 We will be thanking the community at our office with seated massages, Reiki, Accupuncture, raffles, makeup demonstrations, refreshments and sale items. Dr Brooke Stillwell is hoping that the community will come and enjoy this fun day and learn about other businesses focusing on wellness offerings around town. The event takes place a week from today – Thursday, September 27th from 10:00 am – 6:00 pm. All of these take place at 205 Turnpike Road. If you have questions, call 508-353-0483.